my discovery of Bread: Croissants with sourdough, what a success! For a long time I saw beautiful croissants baked by fellow bakers. I wanted to give it a try too. I wasn’t scared by the bakers who wrote on how difficult it is to bake croissants. I like a difficult recipe, this keeps my thoughts were they should be. And as soon as we found the special folding butter I could bake them. (ok, we bought margarine before using the expensive real butter). I had another reason to make croissants; I wanted to bake Tartine’s Morning Buns. You need croissant dough for it. I did and they were great, but I have no photos, because we were in a hurry to go to Holland. These Morning Buns tasted delicious and looked great, but they were too big for us. Maybe for an afternoon snack? 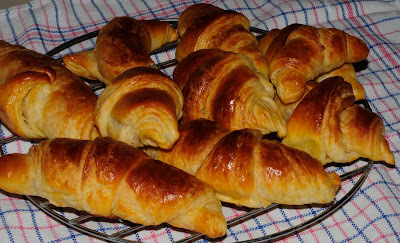 The croissants were great and I will bake them again and again. Not only because I still have a lot of folding margarine left, but because these home made croissants are delicious and fun to make. I agree with Sue; “It is achievable and the results are truly rewarding”. Before you start running to your kitchen, please read the whole recipe. It takes some days before you can eat a croissant. The first day you make the Italian levain formula and the second day you need to make the first dough. Then on the third day you can bake your croissants. Because I had no experience with croissants what so ever (only eating them off course) I followed Sue’s description of the recipe to the letter. This recipe is great and Sue is so kind to allow me to use her description of this recipe. Go and have a look at her croissants and other beautiful baked breads. Off course all credits for the description of this recipe go to Sue. Sue omitted the small amount of egg in the first dough (preferment). The final dough used half of an egg. She used the leftover half as an egg wash. The original recipe calls for osmotolerant yeast, which she didn't have access to. She used instant dry yeast and increases the amount by 20%. I used all purpose flour and didn’t have malt, so I omitted it. I used margarine folding butter in stead of real butter. Preparing roll-in butter for lamination: Remove the butter from the fridge. Pound the butter with rolling pin between two sheets of baking paper into neat even rectangle or square with 5-mm thickness. If the butter becomes too soft, store it in the fridge for 15 minutes before using. Take the croissant dough out of the fridge. Flour the working area well. Using a lightly floured rolling pin, roll the dough out into twice the size of butter block (roll-in butter). Place the butter in the centre of the dough and fold the dough over the top. Seal the edges of the dough together to ensure the butter is completely enclosed in the dough. Take the chilled triangles out of the fridge and shape into croissants. Gently pull the tip of triangle to make the triangle longer. Make 1-cm incision at the base of triangle. Pull away two corners at the base and roll it towards the tip. Make sure that the tip is tucked underneath the croissant. Not like mine; my tips are on top. Brush the surface lightly with egg-wash.
Cover the tray with tea towel. Let it stand at warm room temperature (25˚C -27˚C) for 2 hours until it almost double in size. Brush the surface of croissant with egg wash before baking. Reduce oven temperature to 190˚C and bake for 20 - 25 minutes until it is deeply golden brown. Great result for the first try, Connie. Hardly anything can beat home-made croissants..it's simply satisfying.